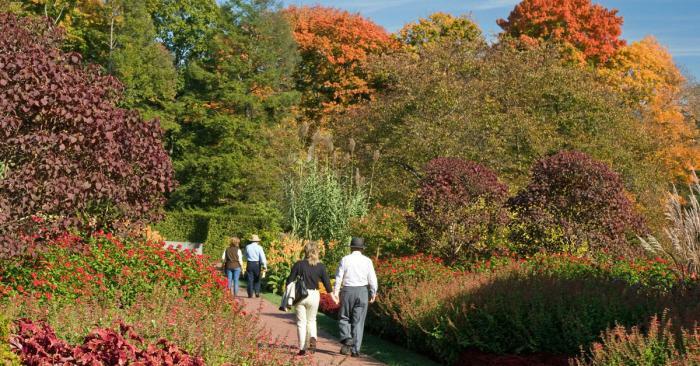 Fall is an amazing time to visit Wilmington, Delaware and the Brandywine Valley, thanks to refreshingly crisp days, a bustling cultural calendar, and Mother Nature&apos;s vibrant autumnal display. Leaf-peepers will enjoy kaleidoscopic backdrops of golden yellow, crimson red, and fiery orange leaves, if they get their timing (and scouting locations) just right. We&apos;ve rounded up this list of eight picturesque places to enjoy fall foliage right here in the Wilmington region, paired with historical sites and fun things to do! This magical 1,077-acre public garden makes visitors feel like they&apos;ve ventured into a real-life fairy tale. Towering trees, radiant flowers, meadow gardens, fountains, and art sculptures entertain nature enthusiasts with 11,000 different plant species on site. Come fall, Longwood Gardens is set to host its annual Chrysanthemum Festival, showcasing more horticulturally challenging displays than ever before, including the Thousand Bloom Mum, the largest in North America. This botanical garden is famous for its rural pastures that are home to a wealth of woodland creatures, giving it a true enchanted forest feeling. Celebrate trees in their autumn glory at Mt. Cuba Center’s Tree Festival on September 24th! Discover how trees add beauty and value to our landscapes and enjoy family activities, hayrides, demonstrations, and more. 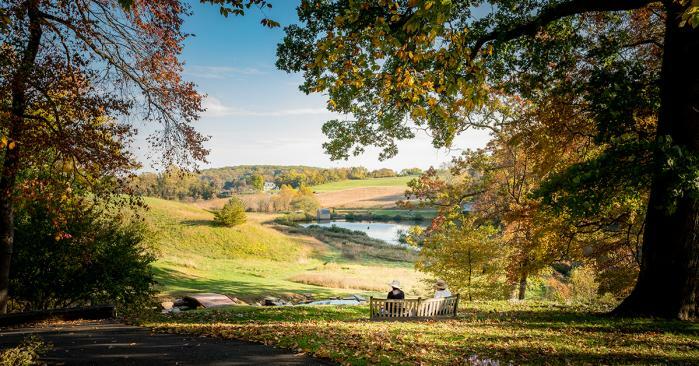 Set on 235 acres along the Brandywine, Hagley Museum is a treat for nature lovers and history buffs alike. This example of early American industry includes the original Du Pont company’s restored mills, workers&apos; community, and the ancestral home and gardens of the du Pont family. 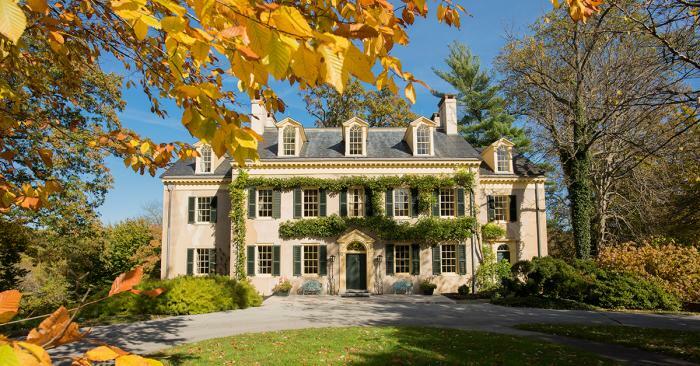 While taking in the fall foliage along the banks of the Brandywine, visitors can also tour the home, witness gunpowder demonstrations, and explore exhibits within the museum. Belonging to the prestigious antique collector Henry Francis du Pont, Winterthur Museum, Garden & Library is a mansion-turned-museum that houses many of his prized possessions for the public to see. Enjoy tours of the house and spectacular 60-acre garden, special exhibitions, shopping, dining, and more. Beginning October 20, you can visit Royal Splendor: The Coronation Gown from The Crown. This is the first in a new Winterthur exhibition series entitled Eye on the Iconic and will feature the replica coronation gown worn in episode five, “Smoke and Mirrors,” of the Netflix series The Crown, a dramatized history of the reign of Queen Elizabeth II. 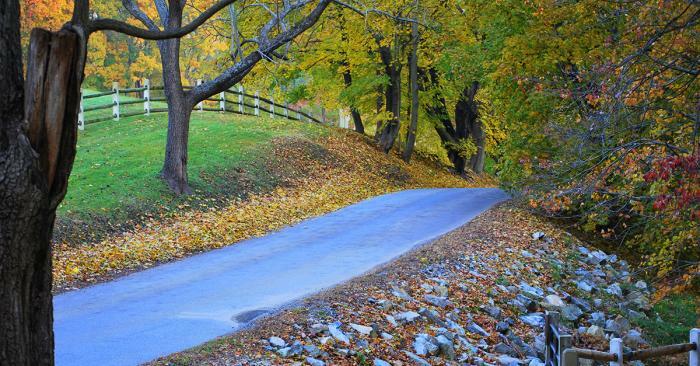 See vibrant displays of sweeping color along the Brandywine Valley National Scenic Byway! 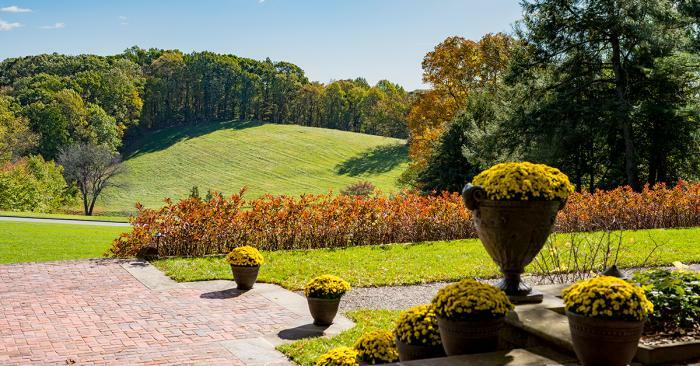 Drivers can view the magnificent rolling hills, orange and red-hued trees, historic farms, covered bridges, and the Brandywine River. Be sure to make several stops along the scenic route to further explore the historic sites, grand estates, glorious gardens, and mesmerizing museums. Climb aboard a train for leaf peeping this fall and leave the driving to someone else! 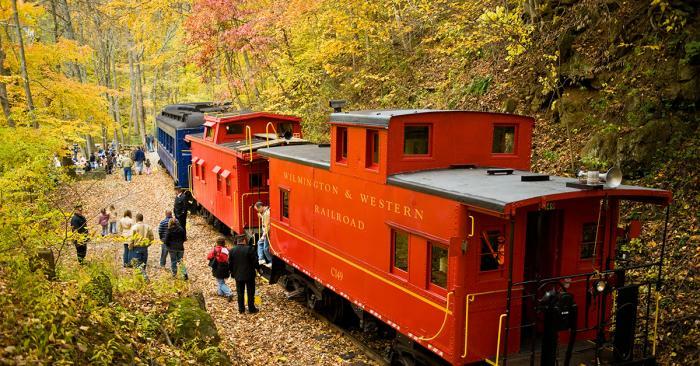 There&apos;s no better way to enjoy Delaware’s autumn spectacle, bursting with brilliant color, than on the historic Wilmington and Western Railroad, known for its vintage steam locomotives. Every fall, the railroad hosts its own Autumn Leaf Special, offering group rides lasting 1.5 to 2.5 hours through the pristine forests of red, orange and yellow in luxury coaches. Treat your eyes to a panorama of colorful leaves by going on a scenic walk through the town of Historic New Castle. Steeped with history, this charming town boasts Colonial-style homes, a preserved courthouse, a Federal period mansion, and picturesque gardens -- all carefully placed along tree-lined cobblestone streets. At night, join the New Castle Historical Society for the only ghost tour that brings you inside one of the most haunted mansions in Historic New Castle, the legendary Amstel House. 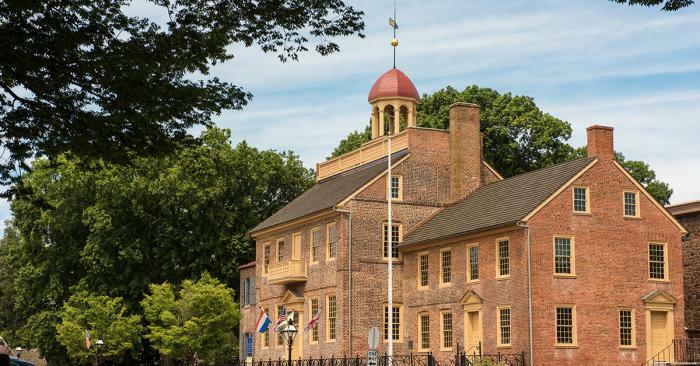 After exploring the Amstel House, you will be guided through New Castle&apos;s darkened streets where you will hear tales of hauntings and learn about the 360-year history of this Delaware River town. Tip: looking for more ghostly adventures? Join in on actual paranormal investigation at Fort Delaware State Park along with professional paranormal investigators, using electronic magnetic field detectors, data recorders, and other techniques. Whether you spot a ghost or not, you’re sure to have a frightfully good time! See rich auburns and buttery yellows as you admire the historic charm of Bellevue State Park. Walking and jogging are popular activities at any time of the year. A 1-1/8 mile fitness track circles a catch-and-release fishing pond stocked with bass, catfish, and sunfish, while the nearby exercise trail offers a refreshing workout. Every year, the park is home to the Vendemmia da Vinci Wine and Food Festival, where guests can feast on delectable dishes from 25 local restaurants, sample delicious Italian wines, and enjoy a selection of live classical and contemporary music. Take time to savor the fall season’s many splendors. 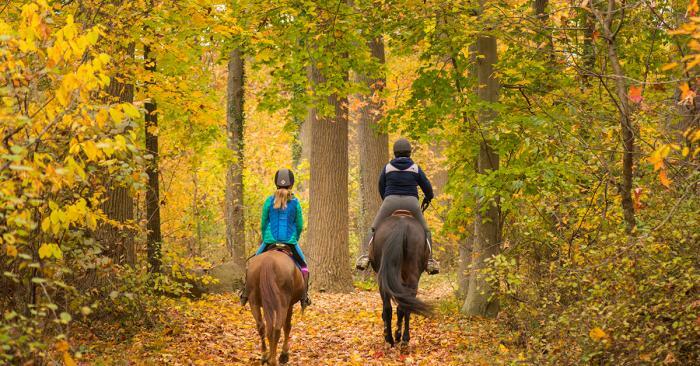 Start planning your autumn adventure in Wilmington and the Brandywine Valley by requesting a free visitors guide today!